The French word "Giclée" (pronounced zhee-clay) translates in English to "spraying of ink". Giclée prints are high-resolution digital reproductions of original artwork using sophisticated printers that spray tiny droplets of ink onto photographic papers, fine art papers, canvas and other media. The Giclée printing process provides better color accuracy than other means of reproduction and the quality rivals traditional silver-halide and gelatin printing processes. If done properly, Giclée prints are often hard to distinguish from original artwork. Because high quality archival inks and paper are used in the process, Giclée prints have light fastness ratings of 100 to 200 years. Highly collectable, Giclée prints are an established medium in the fine arts community and are well accepted in museums and galleries around the world. From 2006 through June 2017, Creative Heartworks produced Fine Art Giclée Prints for Portland area artists. Now we only produce prints for a few local artists and for ourselves. Giclée prints are advantageous to artists who want to reproduce their art but cannot afford to have it mass-produced. Once an image is digitally captured and archived, Giclée prints can be made as needed and at a reasonable cost. Another tremendous advantage of Giclée printing is that digital images can be reproduced to almost any size and onto various media, which gives the artist the ability to customize prints for a specific client. A digital image of the original artwork is always required to create a Giclée print. Image capture is accomplished by having the original work of art scanned or professionally photographed. Even the best digital image requires some fine-tuning and color correcting. Using the original artwork for comparison, the digital image is adjusted to match the original’s color and balance as closely as possible. This is done using an Adobe PhotoShop CS5 and the process can be challenging since artists use a large variety of colors and often create new ones by mixing on the palette or canvas. Our Giclée prints are created using the Epson Stylus Pro 9800 - the 44-inch professional wide-format printer with 8-color ink technology, which produces archival prints with amazing color fidelity, gloss-level, and scratch resistance, while providing consistently stable colors that significantly outperform lesser ink technologies. There are many and varied types of media used in printing and each printmaker will favor different fine art papers and canvases. 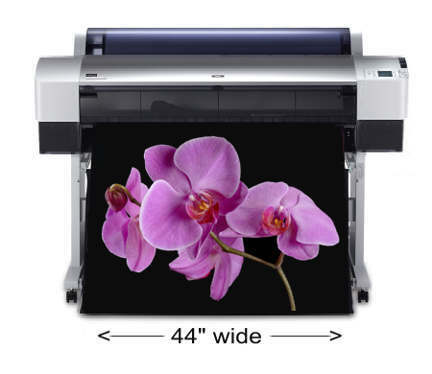 Creative Heartworks typically uses Epson and Breathing Color products. We add a protective coating by spraying all fine art prints with a UV Water Resistant Lacquer. This clear polymer-based lacquer greatly enhances UV light resistance and increases water resistance. For Giclée Prints on canvas, a Satin Varnish is applied. Creative Heartworks provides a Certificate of Authenticity for all prints on paper or canvas. Each certificate provides the artist’s name, title of the print, year released, edition type (open or limited with the number in the series), ink type, media type and dimensions. Having Open Edition or Limited Edition prints made is a decision made by the artist or the artist's agent or publisher. A limited edition print is one that is limited to a preset print quantity. The artist often signs the print and each individual print is numbered. The numbers on the print indicate the individual number in the edition over the total edition series. For example, a print numbered 5/100 would be the 5th print in a series of 100. 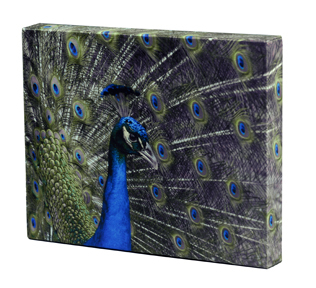 A gallery-wrap canvas print is stretched over a wooden stretcher frame and attached in the back leaving no staples or nails on the sides and can be hung without framing. Printmakers can extend or add to the image for a continuous or mirrored effect or print a solid color to cover the sides of the stretched canvas. Creative Heartworks uses a gallery wrap system specifically designed for Giclée Prints. A hand enhanced or hand embellished print is a print (usually on canvas) that has been retouched by the artist using brushstrokes of paint or clear acrylic gel to add texture and depth. By doing this, the artist creates a unique work of art, which adds value and marketability. In some cases, artists and/or printmakers employ others to perform the hand enhancement. Therefore, “hand enhanced or embellished” does not always mean “artist enhanced or embellished”. Since this fact is not always revealed or acknowledged, art dealers and customers should ask. Creative Heartworks does not offer to enhance or embellish prints for artists. Debbie only enhances prints produced of her original artwork.